There’s a stereotype of a historian as someone who spends their lives in archives and libraries, prowling through stacks of tattered manuscripts for a previously unseen description of some famous event. That’s not a hundred percent wrong – if a researcher doesn’t feel a certain thrill when finding some obscure primary source, they’re probably in the wrong business. Archives are far from the only resource, though, and many historians write with personal experience of the subjects of their study. This might mean that a scholar who focuses on the Napoleonic Wars has taken a long hike carrying a pack, cartridge bandolier, and rifle, so that they can appreciate the lives of French soldiers who marched for hundreds of miles through wilderness on their way to invade Russia. They don’t necessarily have to do it in subzero weather to get an idea of what it was like on the way back from Moscow, though I’m sure it would help make their writing on the subject more vivid. More to the point of my own studies, I’d like to see that Napoleonic historian get together with a group of friends and try making a meal using pots and utensils that they had carried all day. To do it right they should incorporate ingredients that they had foraged, and do their cooking over a fire of green wood that they lit using flint and tinder. A military historian who recreates cooking while on campaign will understand what it meant when so many of the Grand Armee’s wagons were lost while crossing rivers. Not only were the rations lost, but the pots to cook them and the dry fuel. Veterans would have known instantly that food was going to be a problem, and soon. This isn’t limited to military history, or to food. I have great respect for historians like Elizabeth Wayland Barber, who learned a variety of Neolithic skills so she could write “Women’s Work: The First 10,000 Years.” Her knowledge of spinning and weaving allowed her to identify tools that had puzzled male archaeologists. The shipwrights at Roskilde Fjord in Denmark who built and sailed ships exactly like the Viking knarrs they were excavating learned a lot more than just boatbuilding and sailing. They discovered the actual cargo capacity of those vessels, the speed of nautical trade in the era, and much more. My own studies of history have been informed by the time spent in my garden and kitchen, and I have joined a forager to find food in a forest in which I would have starved. When cooking I usually allow myself the use of modern technology like a stove and refrigerator, but try to keep those advantages in mind when coming to conclusions. I have been known to grind my wheat for bread by hand, use a mortar and pestle instead of a spice mill, and hand-chop large quantities of vegetables just to learn how long it takes, all of which have given me a new appreciation of my food processor and stand mixer. I have a tripod and chains that hold a cookpot over the fire pit in the back yard, and on a larger scale have helped another historian pit roast whole sides of beef for a party of 120 people. As for ingredients, at the moment I am growing tomatoes, onions, garlic chives, chard, beets, kale, sorrel, asparagus, beets, eggplant, celery, asparagus, Jamaican tree spinach, radishes, melons, tea geranium, strawberries, oregano, rosemary, two types of basil, and mint. This is along with my apple, lemon, avocado, and orange trees and two types of grapevines, and I’m clearing space for more trees. No, I do not expect the trombone to produce little trombone seedlings. Thanks for asking. This isn’t all of it, but it’s all I can get in one shot. I have learned much from the growing and the eating, and have developed great respect for anyone who manages to live on what they grow. I know the anguish when an unexpected cold snap or sudden unseasonable rains destroy a whole area of seedlings. I can only imagine what it would be like if the sight of those lost plants meant I knew that I’d go hungry later, instead of having to spend a little more money at the store. How long could I last eating just what I grow? Not long. 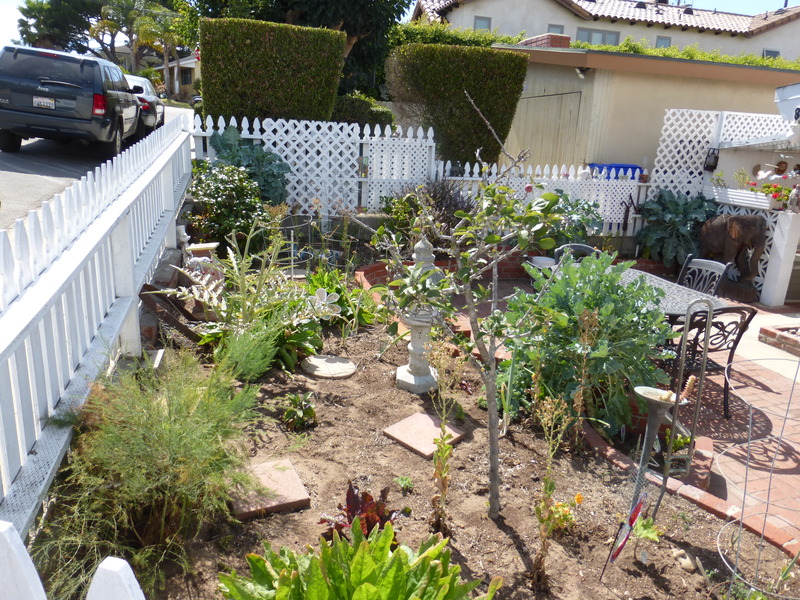 My yard is small, my skills at gardening and harvesting those of an amateur. I am content that there is something from my yard in almost every meal I create, and that my guests can enjoy the flavors of the very freshest produce. I don’t expect to need most of the skills I have learned to survive, but learning them has made me just a bit better at what I do. The odds are that someone out there has an original Picasso and doesn’t know it. It’s a scribble or sketch in a notebook in a dusty attic, a momento from a grandfather who went to school in Northern Spain alongside the great master. The drawing in a student copybook is probably very good for the work of a teenager who is still learning control and perspective. If that drawing was found then scholars would analyze every line, seeking proof that even then Picasso’s genius was apparent. They’d find it too, even if no such evidence was there, because if they didn’t they’d have nothing to write about in their next paper for an academic journal. If Picasso himself had found that drawing while in the prime of his career, odds are that he wouldn’t have cherished or analyzed it. He would probably have thrown it away, though he might have given in to one of the temptations of all creative people. One might imagine him looking at the drawing for a moment, and then taking an eraser to one line, the one that added detail where form was the thing that was important. Once he did that, it would become obvious that the shading in another area was off, and so on. Odds are that after putting in a great deal of effort, he would have produced a piece of work that was mediocre, something more technically accomplished but without the strength and vitality of the original. Almost anyone who creates has an archive of juvenilia, the class projects and hobby pieces that were kept by doting parents, the first attempts at commercial quality work from someone who didn’t really have the skills yet. Some artists deliberately destroy their early and less competent work, others cherish it because it’s a reflection of the person they were and the skills they had. A few artists make a mistake that may be partly from vanity – perhaps to show the seeds of greatness was always within them, they try to finish that novel they started in high school, the sculpture that was a summer obsession. Matching your own early style is actually quite difficult. If it isn’t you probably have a problem, because you haven’t grown artistically in the intervening period. That would have been a good time to stop, but I didn’t. I tinkered with it for over an hour, and then reverted to the original because it was better. Collaborating with my younger self was hard – he had a different sense of order than I do now, and isn’t around to explain what was going through his head. It’s better to just post the things he wrote as they stand, so that’s what I’ll do. The first one is up now, and more will come. She viewed the past as static – whatever happened had already happened, so you didn’t have to predict anything. In fact historians have to reassess what they know when new primary sources are unearthed, and when that happens everything else needs to be rewritten. I have a few cases in point with relevance to my own writings, and since I can’t go back and rewrite the articles and books in question, I’ll address them here. First, one I got wrong. In my article about the history of the burrito, I said that the first known written use of the name was a menu from El Charro Cafe in Tuscon, Arizona in 1922, not in Mexico, where the first documented burrito was served at Bol Corona restaurant in Tijuana in 1934. I also stated that there was no documented reference to burritos in California until 1958, when they were mentioned as a new oddity in an LA Times article. That was the same year they appeared in the Oxford English Dictionary, and the combination of those two references gives the impression that what was previously an obscure item went mainstream at about that time. 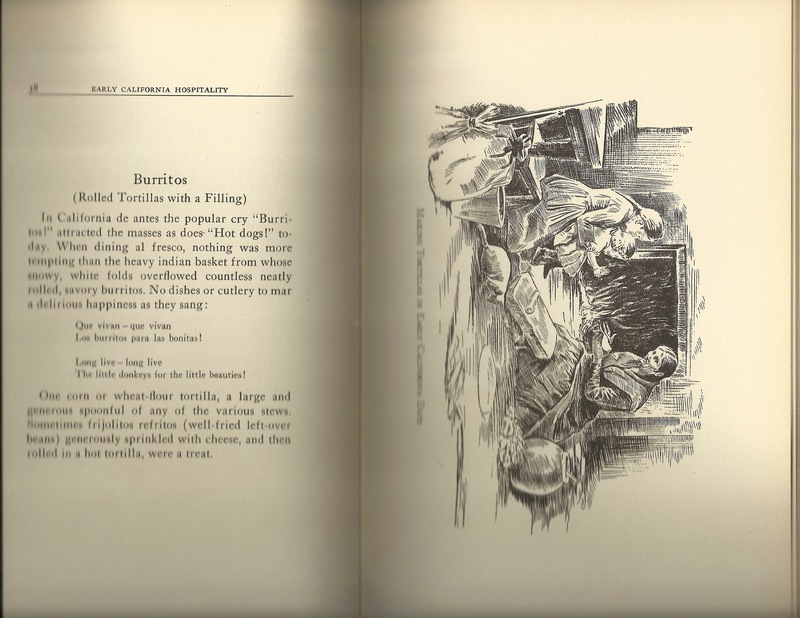 The Diccionario de Mexicanismos has an entry for the burrito as early as 1895… The entry states that a burrito is “A rolled tortilla with meat or other ingredients inside, called ‘coçito’ in Yucatán and ‘taco’ in the city of Cuernavaca and in Mexico City.” The term burrito was popular in Guanajuato, a state in central Mexico. As the dictionary entry is the only hard and fast evidence we have to show where burritos came from, the idea that they originated in Guanajuato seems to be the most likely. That description from 1895 does not mention a flour tortilla, which is one of the basic elements of a burrito as we know it. It is vague and could apply equally to what we now call a taco, taquito, flauta, or a burrito. The fact that an item by this name existed in Yucutan, where corn grows well but wheat very poorly, suggests that there may have been little or no difference between a taco and a burrito, at least in that region. The names of the two items may have been interchangeable then, but a distinction was eventually made between the two items. Interestingly, this is the only citation I have found anywhere referring to an item in Yucatecan cooking called a ‘coçito’ – there is no contemporary item in that cuisine by that name, and I haven’t found any other reference that isn’t directly quoting that dictionary. Given that the word “cosa” translates as “thing” and “-ito” is a diminutive, I could hazard a guess that someone once called a food item “that little thing” while a dictionary compiler was within hearing range. It’s impossible to prove, but it’s at least a plausible explanation for something that is otherwise inexplicable. Note that this refers to a burrito as “one corn or wheat flour tortilla (with) a large and generous spoonful of any of the various stews.” Corn tortillas are almost never made larger than taco size because they have no gluten and aren’t stretchy – they crumble or break much more easily. A generous spoonful of stew inside a corn tortilla would be a mess. The quote also refers to leftover beans, which suggests that this item didn’t appear on restaurant menus because it was something made at home to use up leftovers. I’ve heard this supposition from other historians regarding why burritos didn’t spread more rapidly – if they were primarily a way poor people repackaged leftovers, they would be a low-status item and less likely to sell in restaurants.